A year ago, we shared with you the exciting news of our partnership with Kalispell Regional Healthcare’s Neonatal Intensive Care Unit (NICU). This program was born when KRH approached us requesting that we bring our existing Earn While You Learn (parenting) curriculum to parents whose babies are admitted to the NICU. As this program celebrates its first year of success, we want to share with you the impact of its reach, which is proving to be remarkable. Among at-risk populations, the need for parenting education is staggering. Hope Pregnancy Ministries has partnered with KRH to fill this gap and provide the necessary tools to empower and equip the parents of their most vulnerable patients. Thirty percent of babies admitted to the NICU in Kalispell are due to extensive drug use of the mother. Medical professionals have communicated anxiety over discharging these infants, doubting the ability of such parents to provide rudimentary care. Kalispell Regional Healthcare recruited Hope Family Resource Center to be part of the solution by inviting us to lead parenting classes in the NICU! Through our developing program, parents receive instruction on basic infant care including touch, eye contact, SIDS education, breastfeeding, and identifying the basic cries of a newborn. Aside from these group classes led by our Resource Center Director and volunteers, parents have an opportunity to read literature and complete homework assignments to acquire additional parenting strategies. As lessons are completed, parents earn “baby bucks” to be redeemed at Hope Family Resource Center’s Baby Boutique upon their discharge from the hospital. A labor and delivery nurse shared, “The program has been amazing. It has given moms and dads focus, purpose, and something to work on during what can be a tedious stay.” Many drug addicted mothers feel apprehensive to interact with their fragile babies, and often cope by dismissing their role altogether. Our curriculum is helping to remove intimidation by equipping parents with confidence to engage with their infant, and the courage to take their baby home. The Flathead Valley is home to an alarming number of physically drug dependent mothers. 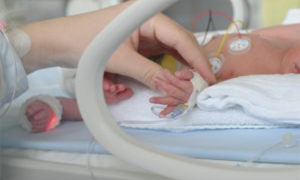 With the ever-increasing drug culture in our community, the medical professionals in the NICU note that they are seeing high numbers of drug addicted (NAS) infants. Nationally, the average stay for these babies is 24.8 days. Since the inception of our initiative, KRH has seen a dramatic reduction in length of stay and has achieved an average stay of just 13 days! Hospitals around the nation have noticed this anomaly and distinguished institutions are asking how they can mirror what is happening in Kalispell. As part of our plan for growing this program, professionals from both organizations are looking toward presenting workshops at their industry conferences to promote the program nationwide. This positive statistical trend has also proven true in relation to foster care placements. Since HFRC has stepped into the NICU, the rate of foster placements for drug affected babies has decreased dramatically from 80% to 11%! Lisa Smith, MSW, lead social worker at the KRH NICU, can’t speak highly enough about the benefits these educational sessions are providing on an emotional and medical level. Lisa attributes the dramatic decrease in length of patient stay and foster care placement to the compassionate and Christ-centered care being offered, noting that this is not a medication difference. This is a relational difference. “We are literally working with prostitutes, murderers and drug addicts. A loving and compassionate model of Christ makes all the difference and offers more potential for lasting change.” In addition, she attests that through this program, Child Protective Services is able to see that these moms have people advocating for them and are better equipped to parent and have proven to be more willing to consider home safety plans for these babies rather than removal. Given the hope of keeping their baby, 80% mothers with NAS infants in the NICU have chosen to engage in the program during their hospital stay. This opportunity has truly allowed us to help those who cannot help themselves. Currently, 30% of the clients at Hope Family Resource Center were introduced from the NICU! We are striving to see this number increase as we engage with parents of these fragile newborns and increase material incentives for participation; material motivations linked to our curriculum attract many parents who have virtually nothing. In fact, the hospital deems the structure of our program so effective that they now see little value in referring to analogous programs run by the state. This conclusion was based on the high retention rate of patients continuing with us after their discharge from the hospital. The potential for influence in this arena is extraordinary. One of our highest goals with this initiative is to not only assist families during their NICU stay, but to form a trusting relationship and see them enroll as ongoing clients at HFRC. Since the start of the program, nine parents who traveled to KRH from outlying towns have cashed in their baby bucks after their baby’s dismissal, and before making their drive home. Fifteen local parents have enrolled as continuing clients, a nearly 100% retention rate! The connection of moms and dads with a mentor at the resource center from birth until their child is two years old has a profound impact on the family unit. Not only do parents learn practical parenting concepts, but also imperative life skills. Most importantly, clients are shown the love of Christ, and through forming a relationship with their mentor, are introduced to the truth of faith as they are ready. Growing our NICU education curriculum is providing a distinct opportunity to encounter the lives of our community’s most at-risk. It is thrilling to consider the profound legacy this ministry could have in the lives of young families by connecting with them at this point of vulnerability. HFRC is working to redeem cycles of family breakdown. Hope Pregnancy Ministries has a vision to be the preferred resource for men and women in need of our services. The leadership of Hope views the NICU partnership as a program that will broaden our reach in order to achieve our mission and vision on a larger scale. By providing an avenue for NICU clients to receive education and become effective parents despite their present challenges, we are meeting individuals who may have otherwise been missed. As you can see, the impact of our work with Kalispell Regional Healthcare’s NICU has far-reaching implications. We’re so excited to share with you the results of this remarkable partnership, and look forward to seeing how our reach into this place of need will impact lives for generations to come. Hope Pregnancy Ministries is a registered 501(c)3 nonprofit organization. Content © 2019 HOPE PREGNANCY MINISTRIES. All Rights Reserved. A copy of Hope Pregnancy Ministries' IRS Form 990 will be made available for public inspection upon request.